Having cemented his position as one of the producers in 2008, with a string of genre-defining releases on many leading labels, including Great Stuff, Craft Music, Turbo Records and Yellow Tail, Ramon Tapia is hot property. Here Ramon teams up with production partner BP for this release on Jericho. 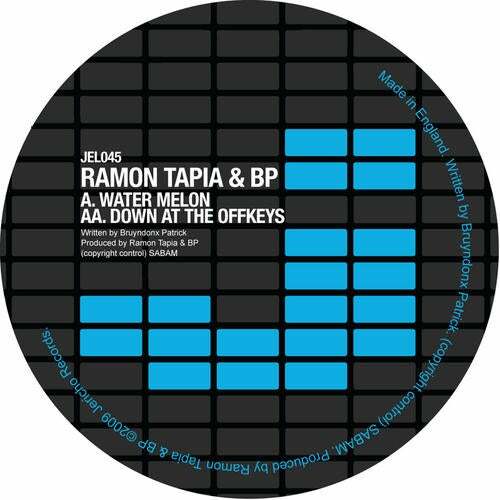 Water Melon is a fine example of the fluid, groove-filled tech house that has won Tapia so many fans. Supplying ample inspiration for both the head and the feet, the haunting melodies that signature the track are partnered by shifting percussion and wobbly, effect-soaked noises to ensure a good melon twisting. Down At The Offkeys steps up the pace and the intensity, but retains the otherworldly vibe of the EP. Throbbing bass pulses under marching beats, while hissing whispers fade in and out of the buzzing synth loops, that usher in rising sirens to take over the breakdown. A high impact crowd-pleaser for dark rooms.